The demands that come with pursuing a career in hockey, or any sport, put a great deal of pressure on an athlete that can be difficult to manage, especially for a young person still finding their way in life. Junior hockey player Brayden Pachal has dealt with those pressures and says that his faith in God has allowed him to stay calm through the highs and lows. Pachal, 19, grew up in Estevan, Saskatchewan, a town of approximately 12,000, a short drive north of the Canadian border with North Dakota. The youngest of three children, Pachal was raised Catholic by his parents, Kent and Rhonda, and formed the early foundations of his faith attending church every week with his parents and sisters, Halee and Brooke, while also attending Catholic school. At the age of 14, Pachal was selected in the Western Hockey League’s (WHL) bantam draft by the Victoria Royals, and the following year moved away from home to nearby Moose Jaw, Saskatchewan, to play a season of “midget” hockey, the next step up from bantam. 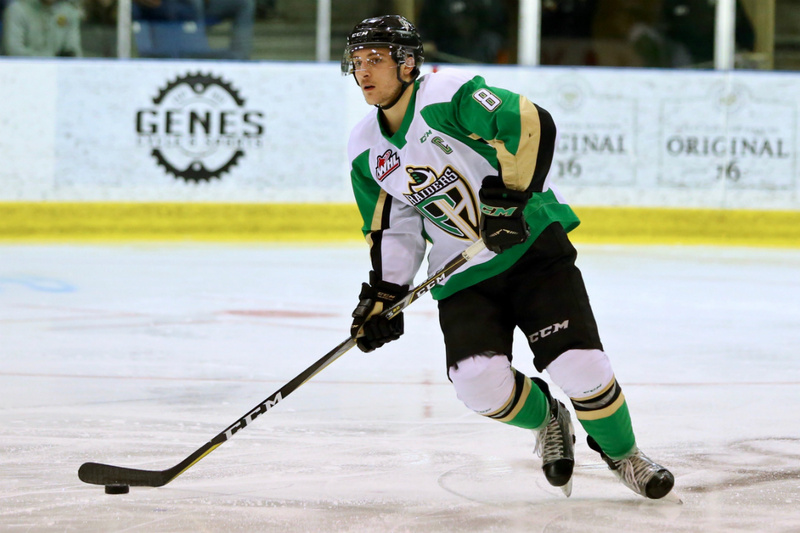 In his first year living away from home, Pachal was able to billet with his aunt in Moose Jaw, which he said made the experience much easier. The next year, Pachal made the Royals roster out of training camp as a 16-year-old. The WHL features 22 teams, 17 of which are located throughout the western Canadian provinces, along with five in Washington and Oregon. It is one of three major junior hockey leagues based primarily across Canada, and they comprise the Canadian Hockey League (CHL). For many, it is the final stepping stone before their professional or NHL career, while others go on to attend and play at Canadian post-secondary institutions. The jump meant Pachal would be moving “way out to Victoria.” Situated on the south tip of Vancouver Island, Victoria is a 90-minute ferry sailing west of Vancouver, British Colombia, and approximately a two-hour ferry north of Seattle. More relevant to Pachal, it is approximately 2,000 kilometers (1,200 miles) west of his hometown. Pachal says that making the Royals roster as a 16-year-old had its positives and its difficulties, as he was one of the younger players in the league, which typically sees rosters populated by players 17 to 19 years of age, and three 20-year-olds per team. 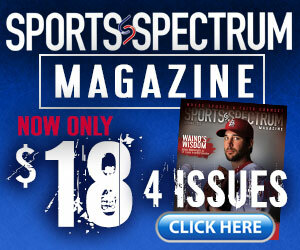 The league also plays a grueling 68-game regular season, which runs from September through March. A challenge for Pachal off the ice was not having the ability to attend church as regularly as he had been accustomed. That is where a new friendship was sparked that helped feed his faith. Through the rigors the season, Pachal makes a conscious effort to stay in tune with his faith, and keeps it front of mind through small gestures. An important passage of Scripture for Pachal is Isaiah 43, and he writes “IS 43” on his sticks before each game as a reminder. “Dave showed me Isaiah 43 when I was going through a tough time, and it helps me stay calm, knowing that God is always with us no matter what we’re going through,” Pachal said. 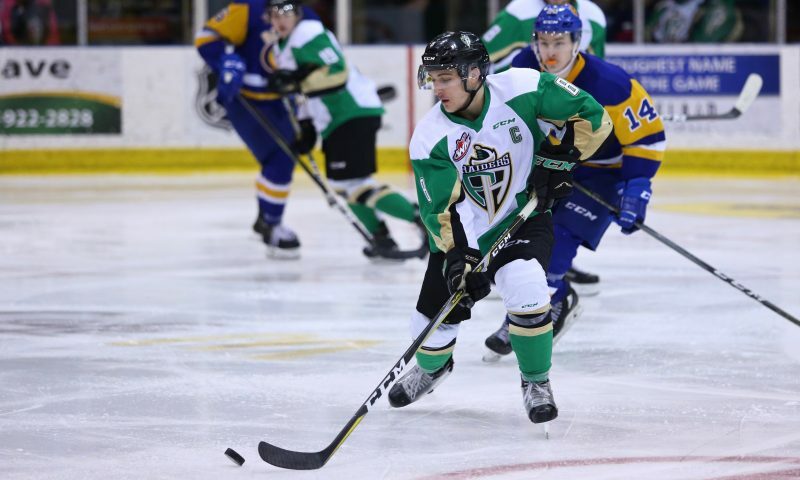 Midway through the 2016-17 season, his second in the league, Pachal was traded to Prince Albert and is now in his second full season as a Raider. In that time, he has developed into one of the league’s better two-way defenseman and is a steady leader on and off the ice for the Raiders. 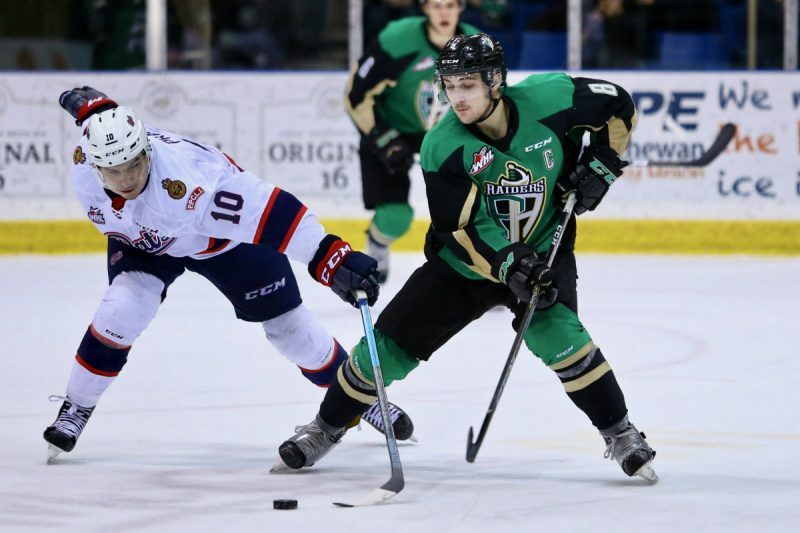 Now a veteran in his fourth WHL season, Pachal was named the Raiders’ captain at the start of this season and has helped guide the team to what is, to this point, the best regular season in franchise history, having been rated the top team in the entire CHL for much of the season. A scripture Pachal points to that speaks to leadership qualities is found in Proverbs 28:1, which states, “Honest people are relaxed and confident, bold as lions” (MSG). Since arriving in Prince Albert, located in central Saskatchewan and much closer to home for Pachal, he has formed a relationship with Raiders chaplain Shane Acorn. He says that Acorn, who also pastors a local church, encourages players to walk out their faith together. The last personal touch that Pachal now puts on his sticks before games is a cross and the initials “A.H.” for his friend and former Raiders teammate, Adam Herold. Herold was one of 16 people who tragically lost their lives on April 6, 2018, when the bus carrying the Humboldt Broncos of the Saskatchewan Junior Hockey League was struck while driving to the team’s playoff game that evening in Nipawin, SK. Herold, 16, had played in four games over the past two seasons with the Raiders. Pachal reflects on the time of grief that was felt nationwide and gripped the entire hockey community following the tragedy. “Losing a friend and teammate like that really hit home. Traveling on a bus is something that all hockey players grow up doing, especially in junior hockey,” Pachal said. “It was amazing to see how not only the hockey community but the world came together, and you still see the continuous support today. Through the support of friends and teammates helping each other out, sharing memories, holding memorial games and gatherings, we all picked each other up,” he said. Pachal says it was a difficult time for him personally. “It challenged my faith with a lot of questions as to why this would happen, and it’s still hard for me to understand, but I trust that God has a plan for all of us,” he said. Earlier this season, the Raiders as a team spent a day in Herold’s hometown of Montmartre, SK, visiting with his family and learning more about their friend and teammate, who like Pachal, was raised Catholic, and had been an alter server at his church. “Adam and his family touched all of us,” Pachal said. With an eye to his hockey future, Pachal is on the radar of NHL teams, having received invites to NHL development camps in consecutive years, first with the Ottawa Senators prior to last season and again with the Calgary Flames before this season. He has the same career aspirations as any other player, and says that it is possible to pursue those goals while staying true to his identity and purpose as a follower of Christ.